Many visitors to the market will recall seeing Bhunny Design's trays of vibrant beads, ready for you to select and have made into your dream necklace, right there, on the spot! 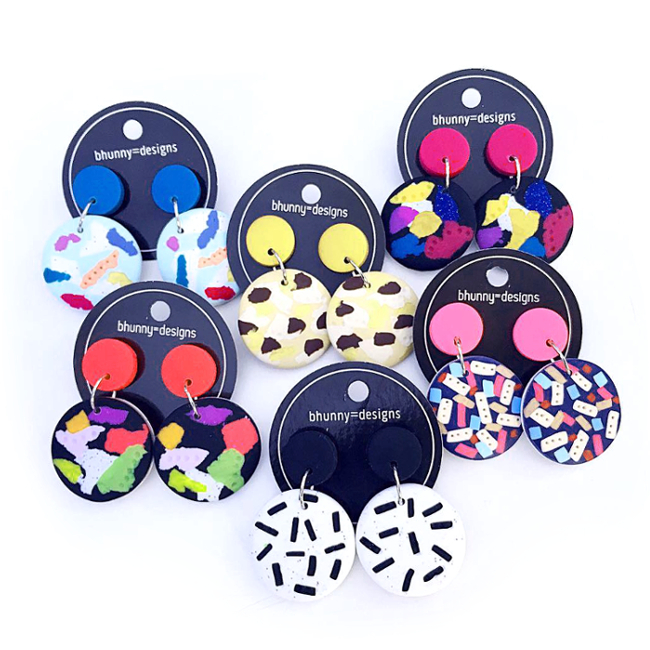 Bhavani, the maker behind the brand, works mainly with polymer clay and enjoys experimenting with a variety of surface treatments and embellishments to create her distinct designs. Come by the market this weekend to treat yourself to a unique Bhunny Design's piece or create one of your own! If old world treasures are your thing, then you'll love Shonah Tomkins and her antique inspired jewellery and accessories. Combining her skills of life-drawing and screen printing while drawing inspiration from her small town roots, Shonah's beautiful range of wearable art is totally handmade, eco-friendly and all individual. Very much reflecting Shonah Tomkins as a designer. In-between her role teaching music Shonah is working on a new linen, demin, vintage lace and Tasmanian Blackwood range to debut at the market soon. Not bad for a small town gal!